Status Poses has the perfect “New Years toasting pose” that was just released as a free group gift. Normally the group is 250L to join, however until January 2nd, you can join the group for free and pick up this great pose that includes two champagne glass static poses. Now, lets get back to some free stuff! Ok, not all of it is free, but mostly! If you haven’t checked out the Ricielli in store Christmas Hunt you really should! There are 20 gift boxes (big and easy to find!) hidden around the store with some really nice prizes inside! Each box is 15L, but you won’t mind paying because.. you can see the prizes before you pick it up on the handy ad below. In the photo above I am displaying several of the prizes. #14 is the Grace Skin with Shadow Gift which sits quite nicely on my shape! It is a sunkissed skin tone with no cleavage. The Sonia Mesh Jacket I am wearing is #10, which goes great with the Mesh Anna Jeans (#8 – three colours included), and the Ianca Mesh Boots (#6 – four colours included). Also take note of the Angel Chimes on the table beside me, because that is a free subscribo gift from Laq Decor. Such a beautiful decorative piece! I also noticed when I was in store hunting, that there is a whole pile of cupcakes on the floor near the back, and those cupcakes are the previous hunt – all huddled together for you for easy searching! Still priced at 15L each 🙂 You can see the prizes for that hunt here at this link! Truth Hair has put a Happy 2013 Group Gift in the subscribo which you can still pick up if you aren’t a current subscriber by subscribing and checking the history. It includes this adorable updo hairstyle in a fatpack of colours along with the 2013 headband. It is tintable and you can turn the particles off. The best part about this gift? You can choose to wear it with or without the 2013 headband! My new years resolution is to be more active and eat less sugar. I imagine that will last about a week. It has been my resolution for about 15 years now and I’m still sitting here eating suger! /me wonders what your new years resolutions are!! Leave a comment on this post and share yours 🙂 Yes.. I know you have to run to Truth first, but then come back and share it, ok? OK! 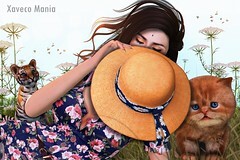 Categories: accessories, groups, hair, hunts, mesh, other, outerwear, pants, poses, shirt, shoes, skins, subscribe-o-matic | Tags: fab free, fabfree, fabulously free in SL, free gift sl, group gift, hunt, hunt SL, Ikon, LAQ Decor, Love Trill, Ricielli, Second Life, sl, Status, subcribomatic, subscribo gift, tres beau, TRUTH, Zigana | Permalink.